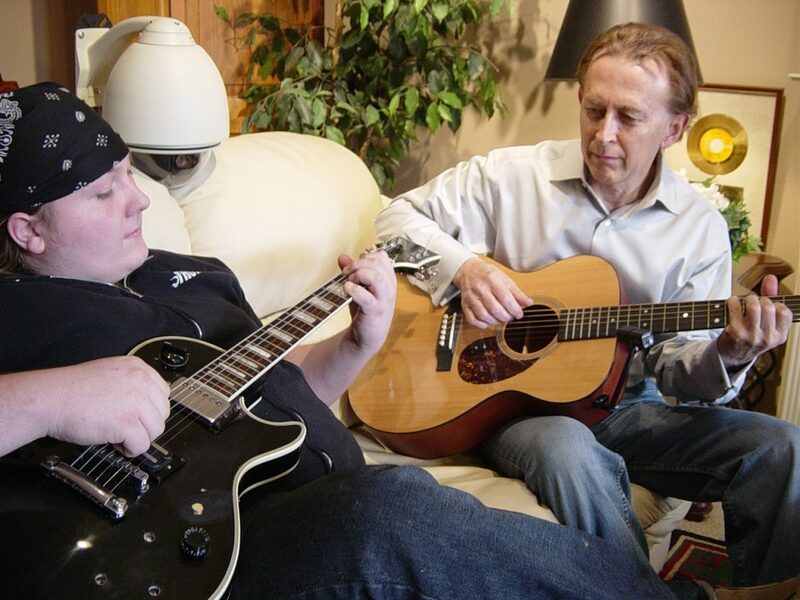 Learn guitar from a Master using the easiest guitar system in the world. Look at the best guitar players in the world and you’ll notice they have one thing in common. They play guitar by ear. Since 1969 Denny Zager‘s taught millions of people to play guitar using his internationally acclaimed “Play-By-Ear” guitar method that shows you how to tap into that part of your brain scientists say we rarely use and “Play-By-Ear” like the pros do. The Zager Guitar Lesson Library gives you the opportunity to learn guitar using a revolutionary guitar system one-on-one from a true guitar master. Library with 100’s of lessons from a 70 year Master player who’s sold over 20 million records worldwide. Learn in hours not weeks or months. Tried and tested by millions of players worldwide. Denny adds new material to his library regularly so there’s always something new and exciting to learn. For 2016 he’s expanding his library to over 150 hours of streaming lessons with over 10,000 Easy Play tabs and 100’s of his patented guitar arrangements making this the largest guitar lesson library in the world. Here is what you’ll receive when you enter the Library today April 22nd, 2019. We set up multiple video cameras with extra sensitive parabolic microphones in Denny’s personal recording studio that make you feel as if you’re right there taking a lesson with Denny. In these full length feature films Denny guides you finger-by-finger, string-by-string, just as if you were in his studio, and shows you all the secrets he’s learned from playing, teaching, and performing over 65 years. Many students say that the knowledge they gained in only one lesson with Denny made such a dramatic impact on their playing that it allowed them to make advances that years of previous instruction were never able to achieve. This is an incredible bargain considering Denny gives personal lessons to only a handful of students annually at $200 per hour. Denny will be adding new lessons to his library throughout 2016. The Zager Guitar System revolves around playing guitar by ear. This is the same way many of the greatest guitarists of all time have learned to play. George Harrison, Jimi Hendrix, B.B. King, Jimmy Page, Keith Richards, Eric Clapton, Jeff Beck, Stevie Ray Vaughan, Eddie Van Halen, Slash, Chet Atkins. The list goes on and on. This easy to use manual will show you how to use Denny’s guitar system by showing you how to play a song right away and NOT reciting endless hours of notes and scales. This makes learning exciting because at the end of your session you have a complete arrangement you can play for anyone. This is the same easy to use manuscript that has shown millions of people how to play the guitar quickly and painlessly. Denny even put made a video (for those who don’t like reading) where he skips through to the important parts that show you what you need to know to start playing right away. The goal of the Zager System is to get you to what Denny calls the “reflex stage” where you’re playing on a subconscious level. You’re moving your fingers and sounding good…you just don’t know how you’re doing it! You may think this is impossible but after 60 years of teaching and seeing thousands of students do it it happens at a much faster rate than you expect. Many students say that learning using a Zager Video Package makes learning from regular tabs completely obsolete. The Zager Guitar Library currently has enough video packages to last most players 7-10 years. 1 30-60 minute Video Guitar Lesson with Denny on that particular song. There’s no better way to learn than having the 70 year master (who invented the system) show you how HE does it close up one finger at a time. These demonstrations will allow you to see Denny play in real time with close up slow speed video of his left hand, right hand, and also a simultaneous two handed view so you can see every one of Denny’s fingers from every possible angle. Denny often tells his private students that learning from him online is actually superior than learning in person because you can back up, pause, and follow these demonstrations again and again until you master the movements yourself. Zager “Easy Play” Tabs are fully downloadable and printable color guides that provide you with the chords and hand movements to play any song you desire. If you compare Zager tabs with regular tablature you’ll find Zager tabs are much easier because they have pictures that show you exactly where to put your fingers. They also have lyrics, verses and bridges which make your finished arrangements sound that much better. Zager tabs are the first step towards reading and writing full arrangements which ultimately lead to playing completely by ear using no tablature at all. Have you always wanted to learn fingerstyle but when you tried found it so complicated that you went back to strumming or using a pick? If this describes your experience then this part of the library is for you. The most comprehensive fingerstyle instruction guide on the world wide web. 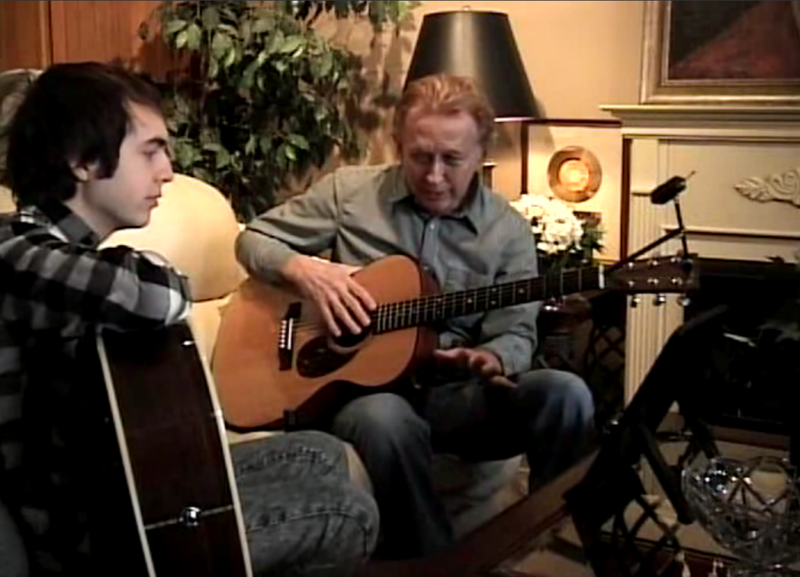 Many players find that Mr. Zager’s collection of recorded guitar lessons that he has given to private students one of the best learning tools of the entire library. These are the exact guitar lessons that students pay $200 per hour for. Denny’s research has shown that the majority of people tend to ask the same questions about many of the same topics. These videos will provide you with the valuable feedback that’s generated from having a student present asking questions. If Denny’s working on a specific musical piece you’ll also receive the full color PDF download for that particular song. This is a tremendous bargain considering all the valuable knowledge you’ll gain from these lessons, only at a fraction of the price. Denny will be adding new in studio videotaped guitar lessons to his online video library all year long. Have you always wanted to write and arrange your own music? Denny will show you a system he’s used over 4 decades, the same system that helped him write the biggest one-hit wonder of any artist at any time in recording history selling over 20 million records. Denny’s taught many children over the last 40 years. To be able to help even more children Denny’s putting together a special section that will have videos and instruction techniques designed exclusively for younger players. Coming Summer 2017. Denny’s spent over 70 years playing and in that time he’s developed a guitar chord library which incorporates full color pictures that will give you instant access to every guitar chord that can be played on a guitar. This will show you exactly how to form each chord and exactly where to put your fingers on the strings without having to read music. As a Zager Guitar Student you will have lifetime access to this part of the library even if you decide to end your membership. Denny’s always adding new parts to his library and this part should be completed summer of 2018. This additional expertise will save you countless hours of frustration, and possibly a damaged instrument. It’s virtually impossible to place a dollar value on what this amount of information is worth simply because so few people have it. Denny will be adding new guitar tuning & adjustment videos to his online video library all year long. 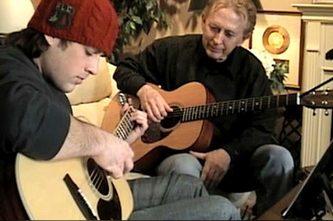 Your opportunity to take a live online streaming video guitar lesson with Denny Zager. Coming Summer 2017! Denny’s always working on new material for his library. Continue to look for new lessons, arrangements, videos, as well as new instruction techniques throughout the year. It’s for this reason the majority of Denny’s students have lifetime memberships. If you would like to try the Zager Library Denny insists that you do so entirely at his risk. That’s why he offers a true no risk 100% unconditional money-back guarantee. Unlike a lot of guitar websites who are trying to make a quick buck, Denny’s program is different for one reason….he’s not in it for the money. Denny’s already had fame and fortune many times over. Denny simply loves music and he loves teaching others how to make music, and he wants to leave a legacy that his students can use for forever. You can see this the minute you take your first lesson with him. Go try all the other guitar courses and compare, but try not to get taken by the fine print offers that only provide a partial refund or worse yet no refund at all. Denny Zager has never done business this way and it’s for this reason he has one of the largest memberships on the world wide web. Download and print all the manuals, tabs and arrangements (those are yours to keep forever) and use the videos for as long as you like. If for any reason you aren’t completely satisfied simply let us know and we’ll refund 100% of your payment no questions asked. In this way you have absolutely nothing to lose and everything to gain. Denny would have it no other way. 9 out of 10 guitar instructors have less than 5 years of experience. Most people fail at guitar not because of their inability to learn, it’s because their instructor has no real experience. Denny Zager has devoted his life to the guitar, playing, performing, building, and teaching thousands of people how to play over 60 years. The average guitar lesson these days is $40 per hour. When you enter Denny’s Library you’ll have access to 100’s of hours of one-on-one instruction from a 70 year Master player. This would cost thousands at the music store (if they even offered it) and tens of thousands in Denny’s private studio. Unlimited access to Denny’s entire library costs only $8 a month. Why waste time and energy driving to a music store when you can learn whenever you want, wherever you want and download everything you need instantly from any computer. Have you felt overwhelmed after paying $40, $50 or even $75 for a lesson with a pro instructor who threw so much information at you that you wished you could rewind everything and play it again? You can replay Denny’s lessons as many times as you like at no additional charge. Denny’s 70 years of work including all manuals, tabs, arrangements and lessons are yours to keep forever. This means you can pass them onto your children to use for generations to come. When you enter Denny’s Library, if for any reason you’re not completely satisfied you’ll receive a 100% refund. We’re a 47 year old family owned company who treats our customers like family so if you’re not happy you get your money back…no questions asked. I got a membership to your videos about 4 months ago. I've always wanted to play, and gave it a few weak tries over the years, but now that the kids are out of the house, I have no better time to really stick with it. I randomly landed on your page one day and after about a half hour of browsing around I bought a year of your guitar lessons. Since then I've learned more and can play more songs then I thought I'd be playing 2 years from when I started. I can't believe how much I've retained and been able to understand and learn from your videos. I thought it would be harder than this! You offer the best advice when you say to take it slow. Well, I've listened to you like a good student and I'm still learning much faster than I ever thought. I'm so glad I chose your Zager Guitar Lessons over the guy down at the music shop. I'm taking it slow but I think I'm really going to get good. Thank you for your awesome information and wealth of knowledge. Denny, I just wanted to write you a short testimonial to say I am doing very well with your lessons. I have learned a lot, not just about how to play, but I also really appreciate the other videos as well about restringing a guitar ( i love your way, by the way! ), and other tips and important things I should know, now being a guitar player. Your lessons are great because I watch them when I have time and I also think you are an easy guy to learn from. I feel like I'm sitting in that room with you and you're talking right to me. This is how online lessons should be. Great job with everything you've done... I'll be a member for a while. Guitar lessons aren't just for kids and teenagers or first time players! I have been playing for over 10 years, and know how difficult it can be to find an instructor with a solid background that is capable of demonstrating the complexities of guitar theory in a way that is both practical and entertaining. Denny Zager is just such an instructor, and I would highly recommend him to anyone who seriously wishes to increase their knowledge and competency with this instrument. I have been an avid blues fan for many years, and Denny's video lessons have made learning theory extremely enjoyable because I can incorporate my favorite musical styles into my learning. I look forward to each lesson. I started taking lessons with Denny about a month ago and have learned so much just in those few lessons. I have found him to be very talented and encouraging. Also, his fingerpick style is awesome and inspires me to keep practicing. Not only do I learn a ton from him but I have a lot in the process, not to mention afterwards too when I can finally play my favorite country tunes. I recommend him for players of all levels. I'm a beginner, but I can definitely see how his hints of encouragement and wealthy of knowledge can benefit everybody. Your course has been so motivational I went and bought a new guitar! And guess which acoustic guitar I bought!? That's right - a ZAD 50CE off eBay. That's another testimonial in itself though. Sweet guitar! Sweet lessons too! The course covers all the examples, theory and basically everything I need to be an all round guitar player and more importantly the price no way reflects the amount of knowledge you receive. There is a lifetime worth of knowledge here, it’s the most amazingly comprehensive course around and it has inspired and motivated me to become the guitarist I dream to be and has paid for itself many times over. It is the perfect course. Thanks for a great guitar video lessons, I'm really putting in the work and following your lead. I bought your year membership a couple of months ago and it's the best course I have ever seen. I have played acoustic guitar for over 6 years and I have picked up my skills mainly by myself, apart from learning the basic chords. To go into my own arrangements is just my own ambition, because even though I'm in my 40s, it's kinda interesting to know how guitarists do it. Because of your Zager Guitar lessons, I now can play fingerpicking songs like I never thought I would. I've started to write my own material which is absolutely amazing to see pull together...Thanks a lot for your very thorough guitar course. You showed everything quite honestly and professionally. Dear Denny, I'm so happy about your video lessons. I'm really liking the fact that now I am making real progress on the fret board. I'm loving the fact that all the different songs I've sang and dreamed of playing for so many years; I'm now able to play them... I can go and down the neck like I never have before, Licks that I have struggled with in the past are coming together and now I feel like in time I can learn anything. It's more fun that I ever imagined it would be. Thanks again! As a student of Denny on Zager.com for some time now, I can highly recommend his relaxed yet extremely professional tuition. His teaching of the guitar is both enjoyable and also highly informative. His sessions are in depth but kept my interest the whole time because he has so much comprehension about playing the guitar to share. His extensive knowledge of both the guitar and music in general is outstanding. I believe I got way more than I paid for. Thank you Denny. I have been taking lessons from Denny for almost 2 years now, found him the same way you just did, online. And in those three years his online lessons have taught me so much, from the basic strumming of chords right up to where I am now, which is writing my own songs. You might think 2 years is a long time to be taking lessons, but it's because he has so much to teach and I have so much to learn. I want to really soak it in, and it's hard not to want to rush to the next step. I don't think I would have been half the guitar player I am now without his method of playing and knowledge of the guitar. Denny Zager is a great teacher whose ease with the material makes the lessons totally understandable and easy to apply. I've had people show me things in person that don't stick with me as well...all that and he's totally engaging to watch on the videos. The lessons are well worth the money. The special arrangements Denny made including the pictures of him forming the actual chords are incredible. These lessons made me a very happy player. Thanks Zager. The good thing about Denny's lesson videos is that they are concise, easy to understand, and laid out in a logical fashion. You start with the very very basics and work your way up. Denny has such a variety of lessons and techniques. Good stuff! I've progressed really fast with these lessons. I can play the songs I want and easily learn new ones too. A couple of my guitar buddies can play about 7 song intros and that's it... not me though.. I'm a Zager guitar lesson student. I wanted to take some time to thank you for all the great lessons over the past year or so. Your take on things has really opened up my eyes and my mind to a much deeper understanding of the guitar. 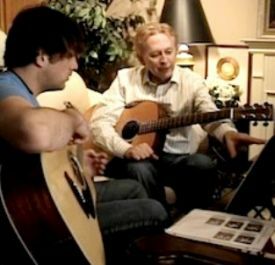 Denny Zager's guitar lesson videos are like having a master class with a living legend right in your home.... any time I have the time. My playing has matured much and my love for the instrument has grown. I now feel free to play more from my heart without having to overthink everything. Head and shoulders above any other instructional materials I have encountered in my many years as a player and a teacher. I only wish I had discovered these lessons years ago. Money well spent! Thank you very much! I have taken over 20 different kinds of guitar lessons and can say with total confidence that these are the finest learning experience any advancing guitar player could have. The lessons are so well structured and focused while your honest approach to teaching the material comes together to form what I consider the best guitar lessons out there. Denny's guitar lessons are unreal. He's very down to earth and up front with his students through his videos. I like that he's very easy to listen to and learn from. Another thing that that I value about Denny's method of teaching is that he actually HAS a method of teaching. Most teachers are pretty haphazard and random in what they teach, and from my own experience, I was often left not being able to integrate everything I was learning into my playing or was presented with lessons that were way beyond my ability at the time. Denny has a system in which he teaches skill sets that build on one another and are reinforced by learning songs that are not only fun to play but integrate those skill sets. I'm already on Stage 3 and loving the whole package! After only a few lessons with Denny's videos, I noticed big changes in my playing. I like his approach to teaching because it pushes me to do my best. He has a thorough knowledge of music theory that dovetails nicely with his mastery of techniques covering a wide range of musical genres. He is an incredible guitarist and can help you develop your chops regardless of your level. The videos are a great way for me to learn guitar at home. I came to Zager.com and Denny's video lessons having never picked up a guitar. My initial intention was to learn some basics and then proceed on my own. A year and a half later, and I still learn new things from Denny's guitar lessons. Denny Zager has sparked my desire to become a MUSICIAN. And most important, he has made it fun. When I first sat down with the idea of learning to play guitar I wanted to go beyond just learning some standard licks and tunes to impress some people who know even less than I do. Instead, I wanted to be able to sit down and play along with whatever was on the radio, the cd player, the ipod. I haven't been playing all that long and already I can do that. No doubt practice makes perfect---or at least pretty good-and that's my responsibility. But Denny's lessons have given me the tools I need to make music from scratch. And that is a beautiful thing (and getting better all the time). Thank you Denny for your totally unique way of teaching and playing the guitar. Being an "older" student I would just like to say to anyone who may be hesitant about taking lessons or learning the guitar being a total beginner, it's never to late in life to learn to play the instrument you have always wanted to play. Denny is a VERY instructor and will teach you at whatever your level and has helped to instill confidence in me as I progress on my guitar I got over 8 years ago but never learned to play. He has helped me to discover a new appreciation for music. Don't put off taking lessons, sign up and begin a new journey in your life, you'll be glad you did! It's something I'm so glad I decided just to go for! In the 6 months or so that I've spent studying with Denny's Zager Guitar lessons, my playing has drastically improved. Having played for about 2 years prior to my first session, I was skeptical of the improvement that I would make as a student, but after only 2 or 3 lessons, I noticed a betterment in my tone, my speed, and my ability to play difficult rhythms. Using Denny's methods, my sound is a whole lot cleaner, and I can play difficult and fast sections of music easily and without error. My improvisational ability has increased, too, simply from following the lessons and instructions I am given. I could not recommend Denny's lesson program any higher. No matter what level of ability you are at, he and his videos can help you improve your playing quickly and easily. Denny Zager's breakthrough teaching methods have been more than beneficial for a beginner such as me. By teaching how to learn as well as what to learn, Denny's lesson videos have given me the insight I need to take my guitar playing to the next level and learn the songs I want to play. His passion lies not only in his fondness for guitar itself, but in the tenacity of forming new teaching methods to inspire and enrich his students. I would highly reccomend Zager Guitar's guitar lessons. I've learned more from Denny's guitar lesson videos in 3 months of lessons (I try to set aside Sunday nights at the very least) then I did in 3 years of lessons (1/2 hour once a week) with my previous teacher. If I had only known about Denny's lessons 3+ years ago I could have saved myself a ton of money and would be a 100 times better player right now.... oh well you live and learn. But I'll be staying with Denny. Thanks Zager Guitar! I tell everybody about you guys. I received a year membership to Denny's guitar videos for a gift about a year and a half ago and then decided to take a break from new lessons. I did this so I could digest everything that Denny has on his website... a lot of material to study and familiarize myself with. During this time I tried out several other guitar teachers just out of curiosity, at music stores, private teachers.. even group lessons at the local college...well, I'm happy to say I am now back with Denny for a second year membership. The moral of the story is that there's no point in going anywhere else for lessons. Denny simply provides the BEST guitar instruction service out there, his style and technique is in a league all by itself. Denny will take you from A to Z instead of most website guitar lessons that drop you off in the dark after simple tabs.... I can't say enough about how much I enjoy watching and learning from Denny Zager. Denny Zager is a very talented musician and teacher. He takes guitar teaching very seriously, and therefore is constantly striving to improve himself and his lesson videos. His lessons are very easy to follow along with and if need be, to replay and watch again, pause, etc. Not to mention there is access to a plethora of information mixed in with each video. All this at a reasonable cost. What more could you ask for...I'm very satisfied with Denny as my guitar teacher because I don't have to set a time to drive across town for a measly hour lesson a mere once a week, then go home with questions about the material and wishing he could show me again. All this is easy to access from my home and I can take 6 lessons a day if I want. Very convenient and they work well! My playing has improved so much because of these lessons. I can fluently speak 2 languages, but I couldn't unlock the language of the guitar. After I found zagerguitar.com and Denny's video guitar lessons, I learned to read that language and use it to make music. I also researched tabs on the internet and got even better at some techniques such as fingerpicking, which seems to be Denny's specialty. I'm so happy I found and chose Denny's Zager lessons. Now I can fluently speak 3 languages.